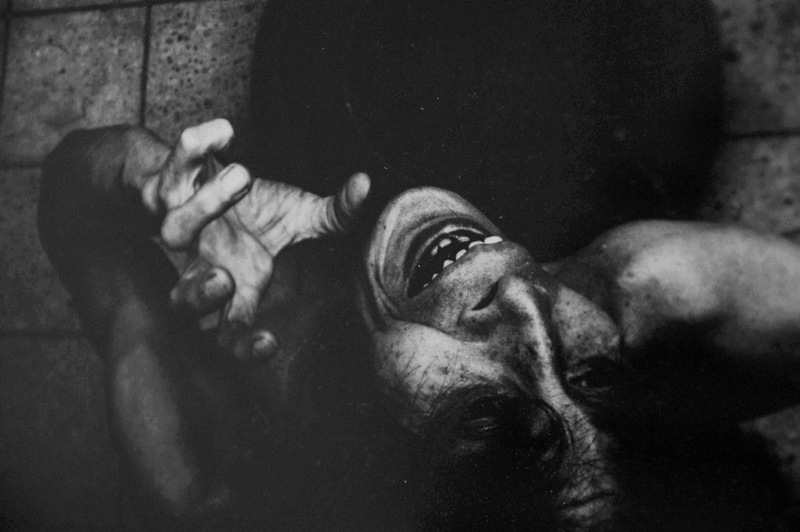 I am Eikoh Hosoe, a photographer from Tokyo. It is a great honor for me to speak on this special occasion about my collection of photographs of Ba-ra-kei, or Ordeal by Roses, and my experience of photographing Yukio Mishima. Ba-ra-kei began one day in September 1961 as a result of an assignment from the Japanese publisher Kodansha. I was commissioned to photograph Yukio Mishima for the cover of Mishima’s book of critical essays, which Kodansha was about to publish. I knew Mishima by name, but I had never met him. I was curious as to why I had been given such an important assignment and was told by the editor over the phone that I had been chosen at Mishima’s special request. I instantly accepted the offer, but the question still remained: Why had he chosen me? Soon the editor and I were to meet Mishima, and I hoped to discover the reason for his request and at the same time have an opportunity to photograph him. A taxi was hired to take us to Mishima’s house. We drove about thirty minutes from central Tokyo toward Omori Station. The cab suddenly turned in front of a public bathhouse, then followed a narrow path, turned sharply, and brought us in front of Mishima’s remarkable house. Beyond the iron gate, there were a few steps and a straight path about thirty feet long to the front door. To the left was a traditional Japanese house and to the right a flat lawn. In the center of the lawn was a mosaic zodiac made of black and white marble, about five feet in diameter. On the veranda, Mishima, half-naked and wearing dark glasses, was sunbathing in a white garden chair. On a table, there was a tray with a cup of black tea and a half-finished grapefruit. It appeared that Mishima had just finished breakfast, alone at two o’clock in the afternoon. “Mr. Mishima, do you mean I can photograph you in my own way?” I asked. “Yes, I am your subject matter. Photograph me however you please, Mr. Hosoe,” he replied. All my questions and anxiety faded. Tatsumi Hijikata, one of my great friends, was the originator of Butoh, a form of dance that is now known worldwide. He was devoted to Mishima’s writing. In 1959, Hijikata’s first major dance performance in Tokyo was based on Mishima’s novel Kinjiki, or Forbidden Colors. Tatsuhiko Shibusawa, a novelist and authority on the Marquis de Sade, was close to both Mishima and Hijikata; he wrote that Hijikata had thrilled Mishima. The photographs of Hijikata to which Mishima referred were from a thin catalogue for Hijikata’s dance performance titled “Eikoh Hosoe’s photographic collection dedicated to Tatsumi Hijikata,” and it included a number of images of Hijikata selected from the series “Man and Woman” that I photographed between 1959 and 1960. I soon realized Mishima never wanted a banal portrait of an author. In offering himself as the “subject matter” of my photographs, I thought he might have wanted to become a dancer himself. I was still in my twenties then, so I was naïve. I did not make the distinction between an international literary figure and a dancer. Mishima’s father happened to be watering the garden, so I grabbed his hose, and I wrapped Mishima’s entire body in the hose and kept him standing in the center of the zodiac, where he was planning to erect a statue of Apollo. I asked him to look up and concentrate on my camera, which I was holding from a ladder above. I shouted, “Keep looking at my lens very intensely, Mr. Mishima! Okay, that’s great, keep going . . .” He never blinked while I shot two rolls of 35mm film. “I am proud of my ability to keep my eyes open for minutes,” said Mishima. “You should wrap the hose around Haruo Sato,” he laughed. Haruo Sato was considered to be a literary giant at that time. But what I really meant was that I wanted to destroy the preconceived ideas about Mishima’s image in order to create a new Mishima. After I left, I thought I had gone too far and told Daido Moriyama, who was then my assistant, that I was afraid Mishima would become annoyed with me. I gave the editor ten photographs. Two days later I received a call from the editor saying that Mr. Mishima was very pleased with the photographs and he thanked me very much. Mishima’s first book of critical essays was published in November 1961 under the title The Attack of Beauty. My shooting sessions continued until the summer of 1962. I had ten sessions in total. In the beginning my ideas were vague, but gradually I came to have a concrete concept that it should be a subjective documentary about Yukio Mishima interpreted dogmatically by Hosoe in devotion to Mishima. How dogmatic? 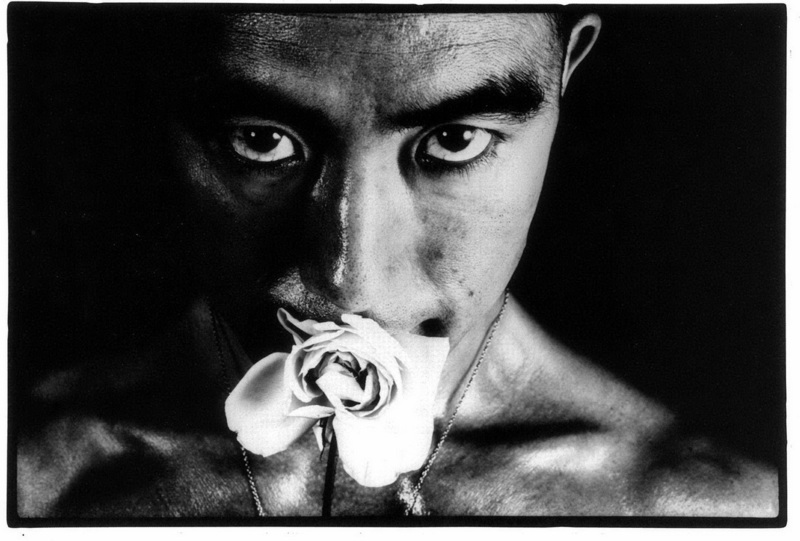 The theme that flows through the entire body of work was ultimately “Life and Death” through Yukio Mishima, borrowing his flesh and using a rose as a visible symbol of beauty and thorns. Before Hosoe’s camera, I soon realized that my own spirit and the workings of my mind had become totally redundant. It was an exhilarating experience, a state of affairs I had long dreamed of. Hosoe merely explored via the medium of his camera—much as the novelist uses words and the composer sounds—the various combinations in which the objects to be photographed could be placed, and the light and shadow which made these combinations possible. For him, in short, the objects correspond to words and sounds. I believe that a person’s soul lives in any of his possessions, particularly in art objects, which live together with the artist’s soul. Therefore I compounded the Renaissance paintings Mishima most loved into his body. I utilized anything he possessed and anything he had relationships with because Ba-ra-kei was meant to be a subjective photographic documentary. Mishima did not have any responsibility at all, except to be the subject. During the six months I photographed Mishima, he never acted like a literary giant. He always carried a small traveling bag in which he put everything. I never saw him behave arrogantly toward anyone. He was sweet and sincere to those who were serious about things. I’d like to tell you about an episode I once witnessed. Mishima often held parties at his home for intimate friends, who included writers, editors, and artists. On this occasion I too had been invited. It was the spring of 1965 or 1966. About twenty people were invited, among them a famous leftist writer and a popular novelist whose work Mishima loved. As everyone drank and engaged in lively chatter, the novelist approached Mishima and said loudly, “Teach me how to write a novel, please, Mr. Mishima.” Everybody laughed because they thought it was a joke. However, the novelist was serious and Mishima took it seriously, too. YOU MIGHT ALSO LIKE: "WISCONSIN DEATH TRIP EXCERPTS"
“I had the same experience,” said Mishima. “When I was commissioned to write a novel for a newspaper, I asked a veteran novelist to help me. He ignored my request by saying, ‘Don’t joke.’” Mishima then turned to the popular novelist and said, “Yes, let’s talk in the corner.” They had a long conversation and I saw the novelist nodding as if he were being given good advice. Finally, I must mention something about the change of the English title. When the work was initially published in book form in 1963, the title was Killed by Roses. Mishima and I chose this title together and the publisher agreed to it. Six years later, at the end of 1969, I suggested to Mishima that we publish a new edition of Ba-ra-kei. He agreed and then I proposed that we use the original publisher, who accepted. At first I did not see any reason the original title should be changed just before the bilingual edition was to be published, especially since it was already well known in the world. Mishima was firm, however. He was so particular about his opinion that I finally agreed, and the English title was changed to Ordeal by Roses, which I like very much. On November 25, 1970, Yukio Mishima committed ritual suicide and I understood well why he had been so persistent about changing the English title. Ba-ra-kei, or Ordeal by Roses, became a requiem to Yukio Mishima, a man of genius and sincerity. 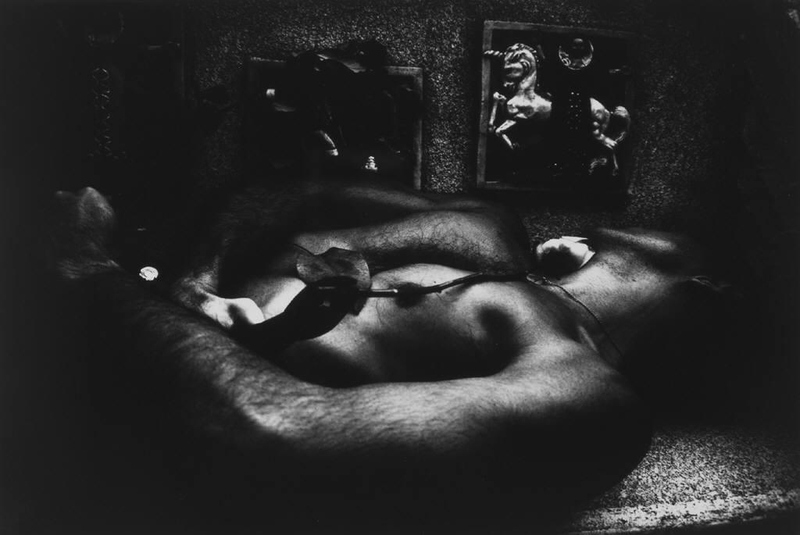 Posted in Essays and tagged Death, Eikoh Hosoe, Japan, Japanese Artist, Kodansha, Yukio Mishima.